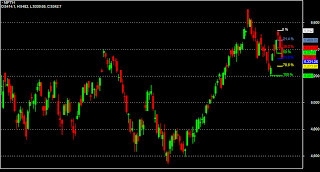 Automatic Fibonacci Retracement Levels plotted in Amibroker. This helps a lot to those who are starting in understanding Fibonacci adjustments. the retracement lines should be plotted. In this AFL levels can be adjusted through Parameters. Which is the standard period to be entered in the parameter menu of amibroker? Is it 5 or 10? Look for a significant high or low made by the price in the near past . This is called the lookback period. Change the parameters accordingly to set to that High or Low . For every chart you will have to adjust to the levels . Significant high or low will have larger effect rather than short term high or low. Sir.. if I am using 5 min chart, which isthe period tobe entered in the parameters option? I would suggest you to use Fibonacci levels in an Hourly timeframe even if you are doing Intraday Trading on a 5 Minute Chart. This is because in a 5 minute chart Fib. levels will not have that much effect to act as resistance or support for long. In an hourly chart suppose the previous High is at an eight period previous Bar than choose 8 periods through parameter. If a significant high is at 5 or 6 previous bars then choose the period accordingly. You may go as far back as you may like according to the swing high and swing low levels which you see that such levels are not being broken by the price frequently. No static level in parameter can be chosen for long as the dynamic nature of mkt. will force the price to make new significant high & lows. Hi there, thanks for sharing. I am new to AFL / amibroker. 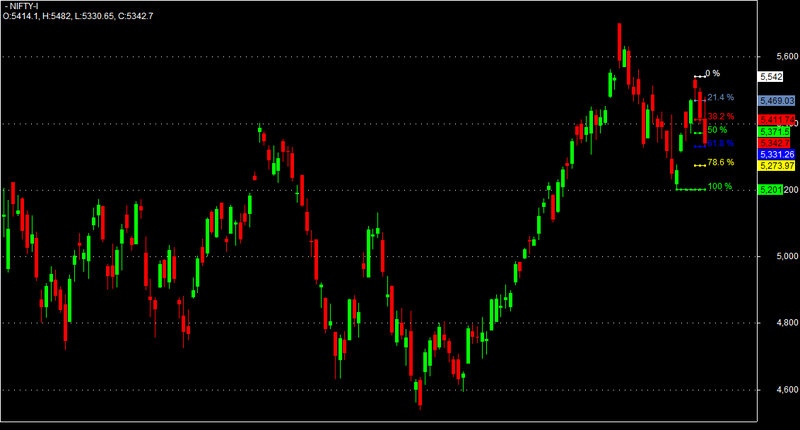 Fibonacci levels are basically plotted from Swing High & Swing Low levels as per the trend in place. these conditions could be really met for plotting. If they can be fulfilled then also this will surely need lot of coding. helpful in prompting you in the right direction or take help with official Amibroker website support team. try to help other members. Hi Trade Catcher, thank for the reply and the usggestion (I have actually created an account on traderji a few years back but havent been active there)! Given my limited coding experience in AFL, I think the 1st block defines which bars and levels are used for the calculations. Do you think that, instead of using the closing price of the stock, using the closing price of a MA(c,200) would work? (how could I do that by the way?). I am not too sure as per why you use a -1 and a +1 in the formula (1st block of code where you find the location adn value of the max & min values), is it possible for you to explicit this a little bit? I find your logic to add the fibo line very clear and elegant. I would like to say that the above code is not created by me. This has been just shared by me after I found it through an internet source. I liked the code for Amibroker users thats why I thought of posting it for my blog readers. your queries. I am really sorry that coding being Greek to me I could not really be a helping hand in that domain.